Alkaline water, ionized water, keeps your cells healthy and allows you to get the most from your body. We offer a genuine 60-day trial period for electric water ionizers. At Alkaline Water Plus we offer flexible payment plans with 0% interest for electric water ionizers. never has to find ways to get rid of it as it does with antioxidants. Molecular hydrogen is known to help all of your cells regain their youthful hydration, balance and bounce. When you ionize water, and make it alkalizing, it also helps your body to clean out the acidic toxins trapped in your cells, So, ionized water or hydrogen water contains plenty of molecular hydrogen to help the body fight free radicals while it also helps you detoxify your body. This is a powerfully healthy combination. Ridding the body of toxins and fighting free radicals are two entirely different, yet both very effective, health benefits of ionized water. At Alkaline Water Plus we offer precise, accurate hydrogen water information and water ionizer comparisons. Written by former teacher/principal for 24 years, our many pages about alkaline water machines are well researched, highly-educational and clear. Why should the pH of your drinking water be alkaline? We all know that the pH of swimming pools and fish tanks need to be balanced, but it was never taught in school how important it is to have pH-balance inside our bodies. Our blood, cells, tissues, organs, all need a slightly alkaline pH, yet most of us eat way too much acidic food and drink to accomplish a good balance of pH [so we get allergies, sickness or disease]. Imagine the fish that live in a beautiful pool of water. They thrive well because their water is constantly cleaned and refreshed, and they would die if the pH of the water got off-balanced. Why is that? It has to do with the ability to carry off toxic wastes from the body. 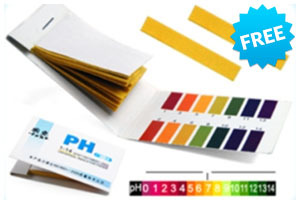 Without pH balance it can't be done. The cells in human bodies must be constantly cleaned and refreshed if they are to remain free of toxins and healthy. Obviously people don't die with the wrong pH drinking-water, at least not right away. But, the way we see our cells' reaction to the wrong water is through sickness, allergies, heart disease, arthritis, cancer, osteoporosis, failing organs, and so on. An alkaline water ionizer machine or filter can help to turn all of that around by giving you a constant supply of pH-buffers all day long. PH balance is a necessity for health just as water is essential for ALL life. Here's how the balance works: The air is acidic, which matches our skin and hair's need for acidity. The cells and organs inside our bodies need alkalinity though. Even the stomach prefers some alkalinity between meals or it will get distraught with too much acidity. Alkaline ionized water does not interfere with digestion or reduce stomach acids, unless perhaps during a meal. This has to do with a few facts: (1) it has no calories so doesn't trigger digestion, (2) it is only lightly alkaline and is easily transformed into the exact pH your body needs, and (3) it absorbs very quickly and completely in just a few minutes...right through the lining of your stomach and intestines. Alkaline ionized water is the perfect source for antioxidants. Not only is alkaline water the best water for the pH balance of the inside of our bodies, but when you drink hydrogen water or ionized water you supply powerful antioxidants to your cells! The kind of antioxidants produced by a water ionizer or hydrogen machine is powerful, because it's so tiny. It's also lipid-soluble, so it can enter the cell and prevent free-radical damage where no other consumable antioxidant can! These antioxidants are called molecular hydrogen, because they are two hydrogens, combined to make a molecule. Hydrogen is one of the main benefits of ionized water! There is a rich abundance of natural, molecular hydrogen antioxidants in alkaline ionized water. Hydrogen makes alkaline ionized water different from any old alkaline water. Alkaline water without the hydrogen antioxidants, would be oxidizing, and wouldn't be healthy to drink. But alkaline water made with a water ionizer is healthy. The minerals are made to be bio-available in the ionization process, and the antioxidants will support a healthy balance to fight free-radicals within and surrounding the cells. Molecular hydrogen antioxidants provide a balance between free-radicals and antioxidants. They do not destroy all radicals, only the toxic ones. Drinking hydrogen rich water has proven to be a very good way to get cells healthy and keep them that way. With alkaline ionized water, you get the harmony of pH-balancing combined with antioxidant/free-radical balancing. There is no more natural, simple, easily absorb-able way to achieve these kinds of balance. The science behind the antioxidants in ionized water is growing exponentially. Read more about the antioxidants in ionized water. Alkaline ionized water is the best water for human consumption! But, what machine to buy? Hydrogen water machines often produce the highest levels of hydrogen rich water. If you can, I suggest you get both types of machines, water ionizer and hydrogen water machine, so you have all the tools you need to get the widest variety and benefits of pH-balancing, filtration and hydrogen antioxidants. Next to air, there is no more important thing for your health than WATER! The kind and quality of water you drink makes a huge difference. Two thirds of your body [being water] is telling you to drink the best water! There is no better way to get the best drinking water than to ionize water using an alkaline water ionizer!!! My extended family and I having been happily ionizing water, using alkaline water machines, for over 20 years. I can tell you, through this experience and the experience of hundreds of customers who have reached out to me with their stories, that alkaline ionized water really is the very best water to help keep you healthy. Getting Sick is Not Normal! I used to think allergies were a "normal" condition. Before I bought my first alkaline machine, I thought the reason for allergies had to do with genetics or environment, and that colds were caused by viruses. In other words I figured it was normal to be sick, at least periodically. However, since our first alkaline water machine, over 20 years ago, I have gained a complete new understanding of what "normal" health is. Being healthy and full of energy all the time, is my "normal" now. Over the years the science of water ionization and hydrogen water has started to catch up in explaining how it is possible that getting sick is actually abnormal, and remaining healthy [even with viruses spreading all around] is the more normal way a body should operate. Alkaline Water Plus really started way back when I was busy being a teacher, principal and mother of five. The amazing benefits of our first ionized water machine changed my family's lives so much that after finally "retiring" in 2007, I decided to start Alkaline Water Plus. My hope was to sell the one product I knew without a doubt would help people. Since that time I've been thrilled almost every day to hear wonderful testimonials of people I've helped to learn about alkaline water ionizers. Allergies and illness can be looked upon as a sign that change is needed. If we don't give our cells the environment and nutrition they need to be healthy, they'll get sick. It's sick cells that cause sick bodies, and sickness really has far less to do with germs and viruses than most people think. The most basic nutrient to all of life is water, and for some reason people have either never known or lost sight of its importance to life and health. Who wants to be sick? It's miserable. There is a happiness factor that can't be measured in dollars that comes with being healthy and productive. Ionized alkaline water has been shown to have disease-prevention benefits. You won't rid yourself of disease if you don't also change the pH of your cells, if that's what is giving you allergies, colds, acid-re-flux, obesity, acne, or other symptoms of an overly acidic body. Water ionizer machines can help you do just that. Drinking ionized water has been the single most positive change that my family and I have ever made for our health. If you have allergies or other signs of an acidic body [illness, heartburn, acid re flux, arthritis, etc. ], or if you just want to stay healthy into your senior years, get an alkaline water ionizer. I am literally healthier and more energized now, in my mid-60's than I was when I was 40 [before I bought my first ionizer]! So many people wait till they get cancer and other really serious diseases before they take the time and energy to make a change! Take any illness [even a little allergy or being a little over-weight] as a sign [that change is needed]. As a matter of fact in the year before buying my first water ionizer I think I spent more in doctor bills [trying to cure things the doctor ended up telling me were allergy-related] than I did on my first alkaline water machine. I am quite sure that since I started drinking ionized water I have saved thousands of dollars in medical bills! Don't let your cells deteriorate into a serious illness... water ionization machines can fit into every budget. I have personally known many people who have used water ionizers to help fight cancer and other diseases. Ionizers are not advertised to be curative devices, however they are tools to help bring pH balance where it is needed in your body...and balancing the body's pH with healthy water can certainly help to facilitate both cure and prevention for all kinds of ailments. Alkaline Ionized Water Gives us Buffers to Help Prevent Illness! Buffering is a must! Why buy a water ionizer? Your cells are begging you for one! It has been long accepted that our bodies need balance, yet as a society we fall further and further away from achieving a proper, healthy balance in our diets and exercise. One way to assist our bodies to get that balance is with buffers. Buffers are things that neutralize things, such as the pH of bodily fluids or the oxidation levels within a body (to name a few). Alkaline ionized water buffers the acids and allows safe removal of acids, fats and toxins from your body. "Safety" is the key word here. Your body is not going to allow any fats or toxins to be eliminated if it perceives it as a threat. For the overall health of your body you need buffers. You need ionized alkaline water for its alkalinity, antioxidants and hydration. Without sufficient pH buffers, antioxidants and hydration you will get sick. By preventing illness you are likely to live a much healthier life. Drinking alkaline water really does work. Doctors & experts alike can attest to the differences alkaline water has made. Everyday people like you and me all see the benefits and you can read on to see what they say. 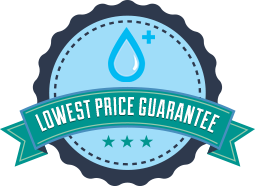 Not many companies can offer up a guarantee like we can at Alkaline Water Plus. We strive to offer the lowest prices without compromising the quality of our products. We want our customers to be happy with their water ionizer purchase, that's why we offer a 60-day return policy on electric water ionizers. 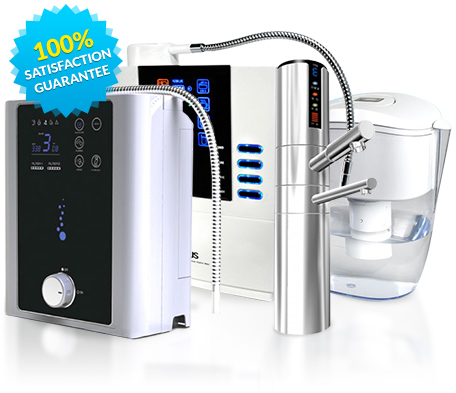 At Alkaline Water Plus, we are interested in giving you the best deal possible on your water ionizer purchase. Guaranteed! We offer you genuine 60-Day customer satisfaction guarantees on all of our electric water ionization machines. Call 1-888-MY-ALKALINE (1-888-692-5525) for a free consultation. Let us help you find just the right water ionizer for you. Call today.